What is "the metropolitical chair"? Of or pertaining to a metropolis; being a metropolis; metropolitan; as, the metropolitical chair. --Bp. Hall. Well, of course, he's right. 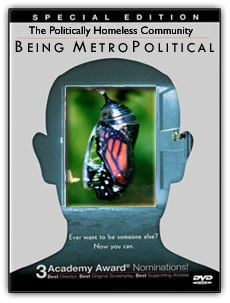 But the problem for us "Metropoliticals" these days is that we have nowhere to go at election time. What if you're one of these people who thinks that Gay Marriage is a natural outgrowth of the human rights movement and that the War on Terror is protecting those same rights? That's not a contradiction in my mind. In fact, it's almost evident. But neither political party seems prepared to accept this. That leaves me... and other "Metropoliticals"... making compromises (and not just about that issue). At the moment, I'm leaning toward Bush because without a victory over Islamofascism the rest is irrelevant. But am I happy with this? Of course not . . . Maybe some day there'll be a true "Metropolitical" candidate. Now there's something for the Internet to generate, after it shakes off its guilt for Howard Dean. The president is in a lot more trouble than he seems to think. His cocky partisanship Tuesday night was unnerving. I'm a fiscal conservative, social/cultural liberal and foreign policy hawk. Neither party provides a comfortable home for people like me. The war made my support for Bush stronger than I ever expected. I still admire his courage during that terrible time and respect his tenacity against terror. This time, I'm leaning toward Bush for those reasons but appalled by his fiscal recklessness, worried by his coziness with the religious far right, and concerned that he has no forward strategy in the war. I'm equally concerned about the obvious irresponsibility of the Democrats on national security (and spending) at a time of great peril. But at least they're not going to bait gays . . .